Preventing galvanic corrosion is a vital consideration when installing an onboard electric system. Galvanic corrosion is the corroding of metal under the influence of an electric current. 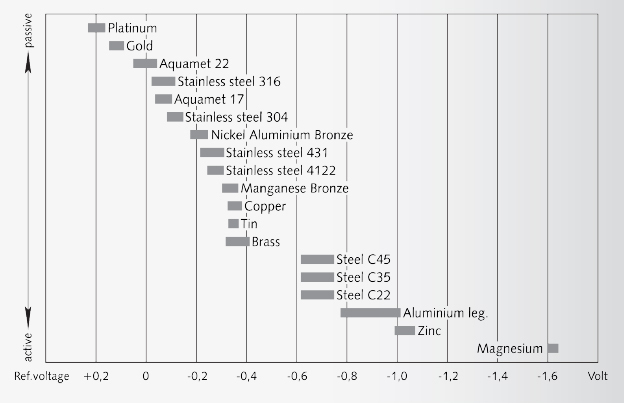 As you can see in the table, every type of metal has a difference in potential with respect to other metals. If components made of two different metals are dipped into a liquid (electrolyte) and short-circuited, a (low) current will flow. This will result in corrosion of the metal with the lowest potential, eventually dissolving it completely. There are three situations that can cause two different kinds of metal to be submerged in electrolyte on a vessel. And it is important to remember that while saltwater is an excellent conductor, brackish water and freshwater can also conduct electricity. Although the first situation is not directly related to the onboard power circuit as such, it is a major cause of corrosion, especially pitting. A propeller made of, for example, manganese bronze is connected to the hull via the propeller shaft, the engine and the negative pole of the battery. On a steel boat, this will result in a difference in potential between the hull and the propeller. The bottom of the boat is normally protected by paint and, therefore, insulated in theory. However, any scratch in the paint will result in two different metals being dipped in electrolyte and short-circuited, and an electrical current will immediately start flowing. To solve this problem, you will need to fit a sacrificial anode made of a metal with a lower potential than the hull, such as zinc or aluminium. The difference in potential between the anode and the propeller ensures that the anode is corroded, not the hull. The second situation does concern the onboard power system. The negative pole of the battery is usually connected to the hull, via the engine for instance. 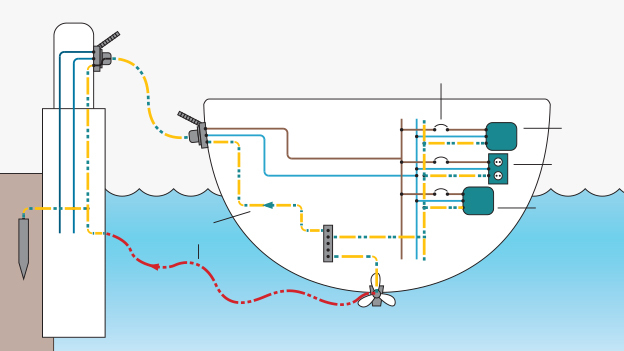 If the boat is used as a conductor, perhaps because the negative pole of the lighting system is not wired directly to the battery but connected through the hull, a small difference in potential can arise between these two connections. This can also cause corrosion and the risk is especially high with aluminium boats if the hull is used as a conductor. In this case, all equipment, including engines, generators, alternators and navigation equipment, needs to be unearthed and the negative pole of the battery has to be connected with the hull at a single central point only. The third relevant situation involves the shore power earth connection. In power installations, the neutral and protective earth are connected to each other at the power station and connected to groundwater via a thick steel rod. This means that all protective earth connections in a harbour are linked to each other. Steel sheet pile walls and quays are also connected to the protective earth via groundwater. When an aluminium boat is moored next to one made of steel, for instance, the two different metals (steel and aluminium) are dipped in electrolyte (water) and a small difference in potential arises between them. 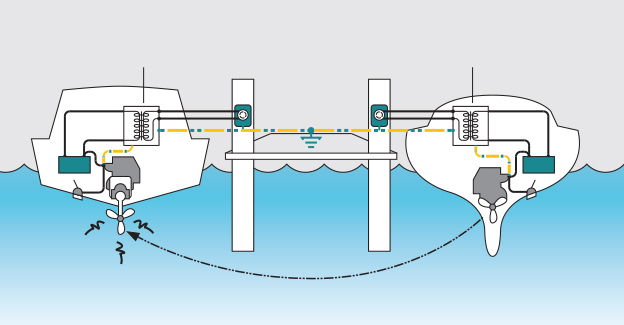 If both hulls are connected to the protective earth, a short-circuit will arise and lead to corrosion. The same can happen if a steel boat is moored next to a steel sheet pile wall. There will be a different potential caused by the different materials. And since they are connected via the protective earth, corrosion will be the result again. The protective earth plays a very important role in securing your electric system, and cannot be omitted. In fact, current legislation (ISO 13297) legally requires a boat to be equipped with a sound earthing system. Potentially dangerous situation, where galvanic corrosion can occur. The risk of corrosion may mean you do not wish to fit your protective earth onto the hull of your boat. However, to ensure your power system is safe you will need to install an isolation transformer. With an isolation transformer, the earth wire remains within the power cable for safety reasons but is not connected to the boat. The phase and the neutral of the power connection will instead be connected to the primary (shore) side of the transformer, which will ‘convert’ the voltage to the same or, if necessary, a different voltage. A new phase and neutral, galvanically separated from the shore, will be available on the secondary (boat) side of the transformer. The neutral will be connected to the onboard protective earth system, which will now have nothing to do, electrically, with the protective earth of the power connection. This way the connection between two different metals (or two different types of the same metal) is blocked, eliminating the risk of electrolytic corrosion. The neutral connection of the other power suppliers onboard, such as the generator and the inverter, also needs to be linked to the onboard protective earth system. An earth leakage switch is prescribed by directive ISO 13297 for recreational craft up to 24 metres. The various options for earth leakage switches and isolation monitoring are subject to this directive. Consult an expert for more details. By the proper use of an isolation transformer, galvanic corrosion can be avoided.